Here we are, Week 2, of the Menu Planning Challenge. I am loving this. It helps me organize myself and get things together on the weekend. Plus, blogging about it holds me accountable as well! What do I have in store this week? Breakfast is going to be my same old, same old. Eggs or oatmeal. Both are so yummy and super easy. 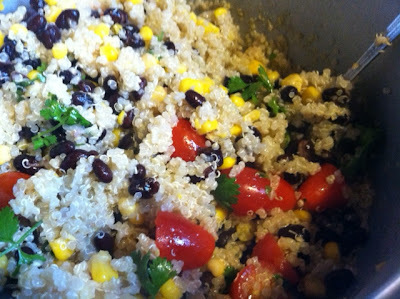 Lunch is going to be - Southwestern Quinoa! Yum. My normal Sunday mess - I just put everything on the counter and get busy. I dug out the potatoes from the garden today and I wanted to have my entire week planned around potatoes. 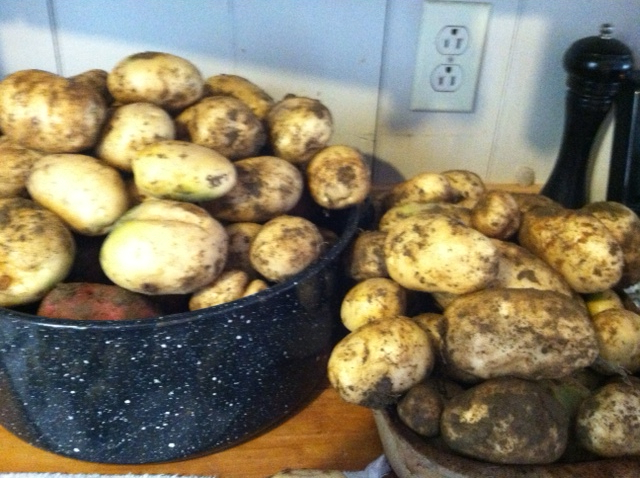 But I'll hold back, especially because I want to be able to eat these potatoes throughout the winter. I also cooked up one of our chickens in the crockpot. This makes for the easiest dinner week. 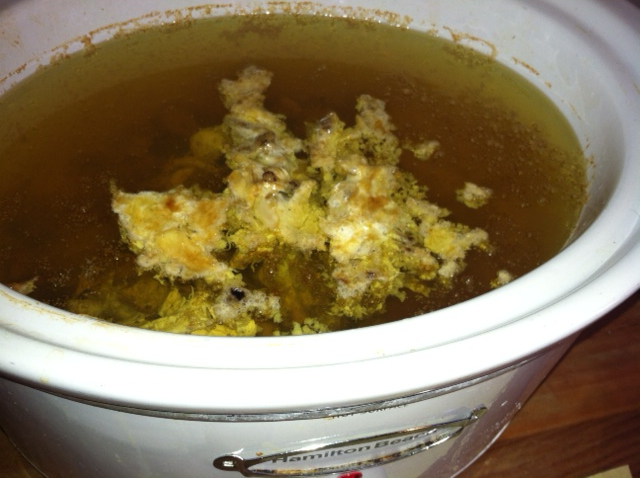 I usually cook the chicken in the crockpot with water, butter, and garlic on low for about 6 hours. Then I pull out the incredibly moist chicken, let it cool off for a bit and then pull it off the bone and remove the fat and skin. I then put the meat into containers and put it in the refrigerator for meals throughout the week and then I put all of the bones, fat, skin back into the liquid and cook on high for another 8 hours to make broth. Most of this broth went into the Sausage/Potato Soup and then I put the rest into a container in the freezer for later use. 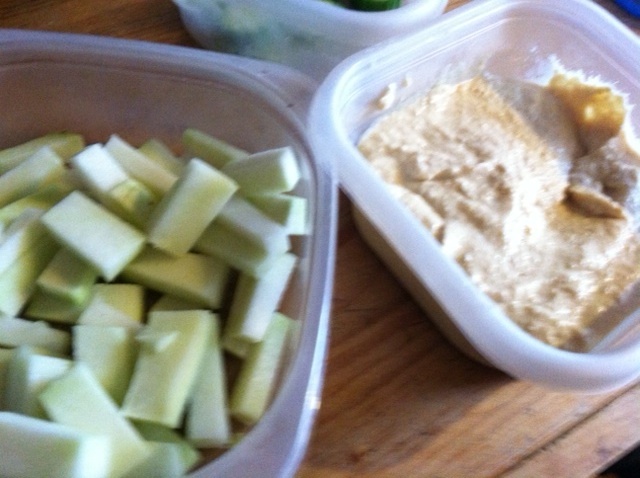 For snacks, I cut up some kohlbabi from the garden and then made a batch of hummus. I'm honestly surprised I have any left, because as soon as Izzy spied me making the hummus, she came over with an empty bowl and spoon and demanded some. menu planning Whats For Dinner? Your lunch looks delicious! I ended up making a big quinoa salad this week, inspired by you. :) Calzones sound so good, too! I'm impressed you had time to link up with your busy weekend, glad you did! I still need to work on the actual planning and execution, but I did stock up at the store last week on a lot of healthy options. I've also finally tried quinoa (though I had a HARD time finding it - we don't really have "health food" stores here - I'll have to try in Columbia). I ended up finding a package that was a flavored "mediterranean" quinoa so I put it with feta, cucumber and halved grape tomatoes and liked it pretty well. Definitely want to try your SW recipe. I made your pumpkin granola this weekend, but I don't think I baked it long enough as it came out a little chewy. I was just afraid it would burn. It's still edible though. 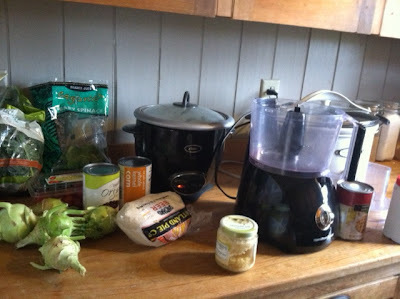 I have a good soup recipe that I've been meaning to make for a week so maybe tomorrow when kids are off school. They won't eat it so I'll have to come up with something else (easy) for them. How do you make your hummus? I usually just buy it. Also interested in the potato/sausage soup recipe and how you make your calzones while I'm being nosy. That quinoa looks tasty and I bet it was simple to make! That looks like the best chicken stock I've ever seen. You're lunch looks so yummy!!!! What a great idea to make a chicken at the beginning of the week and then using it all week. I have been thinking of doing that. How do you keep it from drying up by the end of the week? Your garden must rock!! That lunch does look amazing!